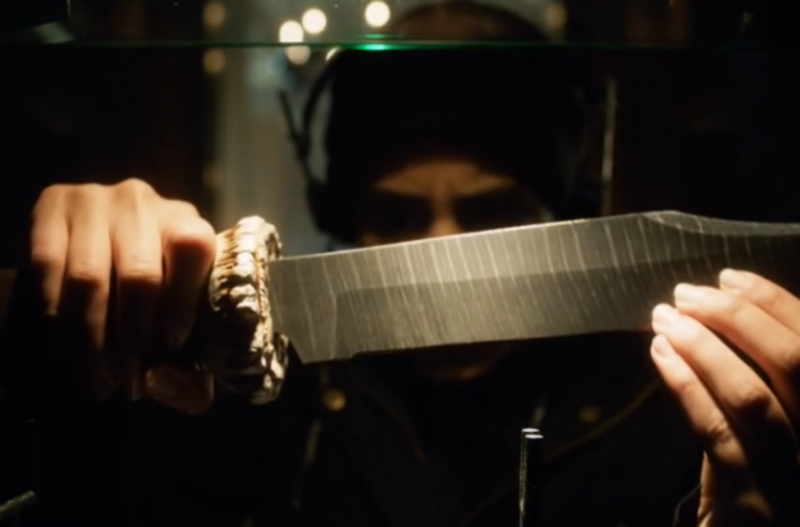 Perhaps a better title for Scarification, the newest Gotham episode, would be The Satanic Rites of Galavan. In one hour, we had the mental images of two arms being severed, an eye being forcibly removed, and in perhaps one of the most wild things I've seen on network television, a man literally, and I do mean LITERALLY, blown up. Scarification introduces a new villain, throws in a little romance, and generally goes crazy. 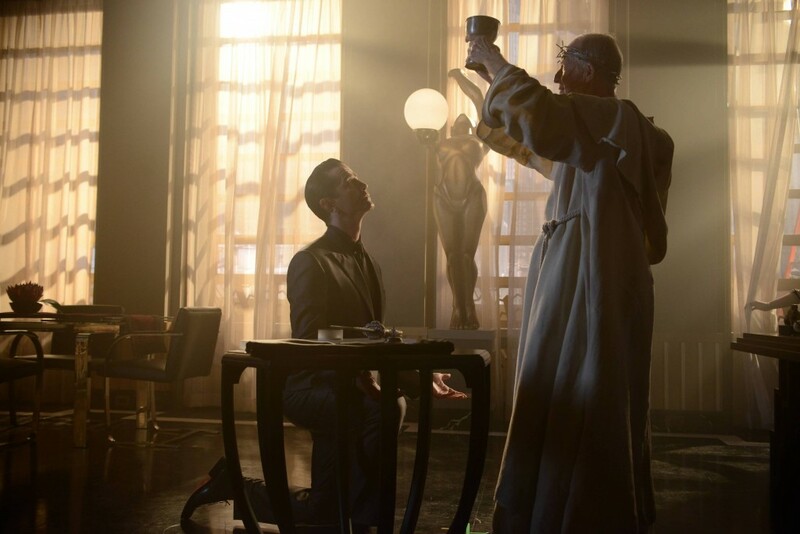 In short, another fantastic Gotham episode. Oswald Cobblepot (Robin Lord Taylor) is still in the death grip of Theo Galavan (James Frain). Now he wants to have a series of fires set in various locations and rejects Penguin's offer of being his willing employee in exchange for the return of his mother Gertrude. Penguin is enraged at his weakness and impotency, but is also puzzled by the strange object Theo and his sister Tabitha (Jessica Lucas) insist he give to his arsonists. These arsonists are the Pike Brothers, but they are loyal to Fish Mooney, so they won't work for Penguin or his right-hand man, Butch (Drew Powell). In order to get them to work for Penguin, Butch goes to an intermediary the Pikes trust: Selina Kyle (Camren Bicondova). Selina vouches for Butch, and they soon start getting their material ready. In what appears to be the COSTCO of crime, MERC, there's a raid by the Alpha Unit Strike Force of the Gotham City P.D., and while he tries to escape, Detective Jim Gordon (Ben McKenzie), shoots him when he pulls a gun. He fires so many rounds that one of them hits the explosive the Pike brother had lifted, and thus, he literally and I do mean LITERALLY, explodes. Penguin is just having a bad time of it. His mother is being held prisoner, he's being forced to do work he hates, and now, the Strike Force has raided one of his cash bases as part of Captain Barnes' (Michael Chiklis) plan to take Penguin down. Still, business must come first, and the Pikes agree to burn it down. However, their much put-upon sister Bridget (Michelle Veintimilla) has to join in the family business. She has to carry this mysterious box, which to everyone's horror, contains an eye. This eye allows access via retinal identification to a secret safe, and in that safe is a large knife. Bridget is almost killed when the Strike Force manages to connect the fires to their common denominator: they all belong to Wayne Enterprises. However, even though Bridget set a Strike Force member, Garrett, on fire, she manages to escape with Selina's help. Penguin is most puzzled by why the Galavans have gone insane over this old knife, until Butch digs up an antiques dealer from the old neighborhood, Edwige (Mary Joy), an expert in old Gotham history. She tells the story of Gotham's Five Families: The Elliots, the Kanes, the Crowns, the Dumas, and the Waynes. One of the Dumas, Caleb, might or might not have violated Celestina Wayne, and for that, his arm was chopped off...with that knife. The Dumas were essentially banished and erased from Gotham history, retreating to a monastery and taking on a new name. Penguin now sees an opportunity to take revenge on Theo and Tabitha with that knife and starts creating a plan of his own. That plan is to convince them he's gone completely mad, and as part of that plan, it means cutting off Butch's own arm. Theo at the end receives Father Creel (Ron Rifkin), the mad monk of Galavans, with the determination to take revenge on the last Wayne in Gotham. I don't think anything will ever top the sight of a man literally and I do mean LITERALLY exploding on network television. I know I repeat this often, but let's take a look at this. And it wasn't just a quick glimpse or an edited scene where we were left with the impression a man exploded. We pretty much saw it all. If Gotham were a pay channel program, I think we would have seen even worse (the eye gouging, the two times a person's arm was hacked off). In terms of what we can see Gotham has clearly pushed the envelope off the table. Now, given that I'm an adult, this isn't particularly disturbing. However, it convinces me that despite the Batman connection I would not let my children watch Gotham. My teens, maybe, but not anyone under 13. However, I have to congratulate Gotham for creating a wild episode, and for some really fantastic performances. 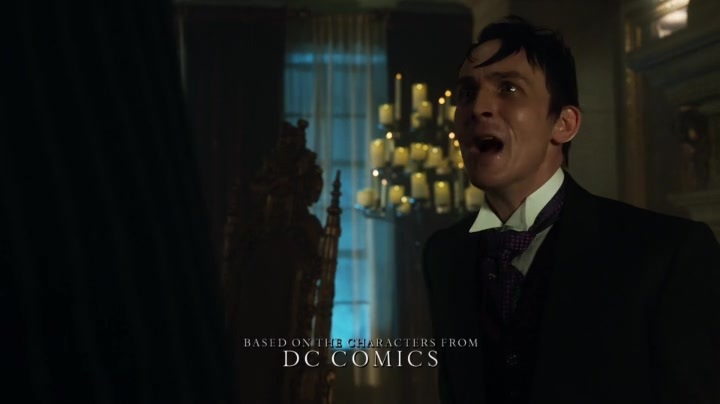 I again declare my unrequited love for Robin Lord Taylor as The Penguin. In his fear, his calculation, his rage, his paranoia (real and faked), RLT just again shows us why he is fast becoming the definitive version of the Waddling Master-Criminal. He's shrewd but desperate, a most dangerous combination, and RLT now starts taking command of the screen after a few episodes where the fear was that the Galavans would step in. Scarification also brought the future villain Firefly. Now, while I understand that the character is traditionally male, but Gotham has cleverly given us a strong backstory to allowing a female to take the role. Veintimillia is excellent as the beaten-up Bridget, who starts to discover her own strength. Bridget is still struggling with being a good person, but she is also tasting the first fruits of victory in a male-dominated world. Her scene with Bicondova was a particular highlight, seeing two good actresses argue about the right and wrong actions to take. In terms of overall story, the Segway into the dark Gothic history of Gotham was fascinating and well-filmed. It also puts the plot the Galavans have in greater focus (although the targeting of Bruce as part of some age-long rivalry is a bit hackney in my view). We also did get a chance to see a nicer side to both Gordon and Edward Nygma (Cory Michael Smith), who is entering the cutesy stage with the luscious Miss Kringle (Chelsea Spack). Their double date (Nygma/Kringle, Gordon/Thompkins) was nice and a nice respite from the overall lunacy of the hour. Scarification is another strong episode in what is turning out to be a strong second season. Rise of the Villains is turning out to be leading to even more shocking stories. Even if the sight of a man literally getting blown up will be tough to top.